About his time of study with Pandit Jitendra Abhisheki who was called a 'Bhishmácarya of Music' Dr Mohankumar Darekar says: "When, in 1982, Pt Jitendra Abhisheki accepted me, my whole life took a new turn. Having been accepted by a great musician and Guru like Panditji meant for me half the battle was won. I took music lessons from Pt Jitendra Abhisheki who kindly allowed me to stay with him for over 15 years, just to impart music to me. I was treated like his own son and was mentored throughout this period during which I was completely away from my family, relatives and the rest of the world. My only focus was my Guruji, the music, and the knowledge. I was so much involved in my Guruji that I had forgotten that law of nature which demands that every beginning must have an end. In 1998 Guruji passed away, and I felt like one orphaned. The fount of knowledge which taught, guided and mentored me, suddenly was no more. It has been years since he passed away leaving behind memories two of which remain permanently carved in my heart." "Pandit Jitendra Abhishekí was like a star in the world of Indian Music who shone forth through his outstanding creative capacity as an artist. He had learnt from many gharanas - schools - and selected from their specific approaches those aspects which suited him best and were most useful for his singing. Combining the highlights of these different schools he created his own style and popularised it. To this day artists from various traditions are singing his music because everyone is attracted by its power of melody." DR VIKAS KASHALKAR became my advisor when I decided to take the PhD examination since he was very supportive of my idea had already coached many candidates. After my Guruji's passing I started taking further training from Dr Kashalkar in the Gwalior style of singing. Furthermore, with his profound knowledge of (mu-sic), his experience as a producer with Television (Doordarshan) and as a writer of various types of literature, Dr Kashalkar has supported me very much in writing my book MAZE JIVANA GANE. When asked why he choose to learn from the Mishra Brothers, Dr Mohankumar Darekar replied: "Coming from the Banaras Gharana, a gharana which brings to us a very rich legacy of beautiful stylistic elements, Pandits Rajan and Sajan Mishra's singing style had attracted me already in my youth and I had listened to their music whenever the opportunity arose. Their style which is very close to Pt Jitendra Abhisheki's style blends very well with my own voice and personal style. Thus it seemed only a logical continuation of the training I had received from Pt Jitendra Abhisheki." 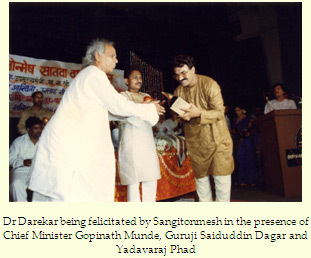 Since 1992 Dr Darekar took training from Guruji Saiduddin Dagar in Dhrupad-Dhamar. Dhrupad is the oldest existing form of Indian classical music. Its origin is linked to the recita-tion of SAMAVEDA, an ancient sacred Sanskrit text. Dhrupad probably evolved from the earlier chanting of Om, the sacred syllable which is supposed to be the source of all creation. Later, the rhythmic chanting of the Vedic scriptures evolved into singing of Chanda and Prabandha. From this early chanting, Dhrupad evolved into a sophisticated, classical form of music. The language of Dhrupad changed from Sanskrit to Brijbhasha sometime between the 12th and the 16th century.